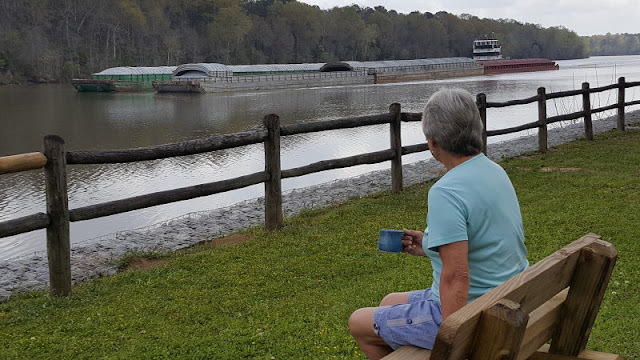 We had mentioned that we really enjoyed the Service COE in Coffeeville, Alabama on the Tombigbee River. At least a few barges to watch every day. 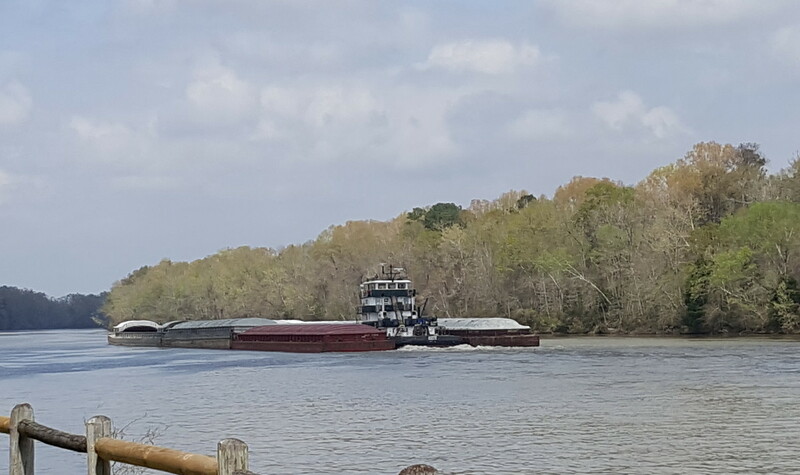 Unlike watching on the Mississippi River in West Memphis, these tugboats are limiting their tow to 6 barges. Probably because the river is narrower and the beds can be quite sharp for a unit that needs multiple football field lengths to turn. 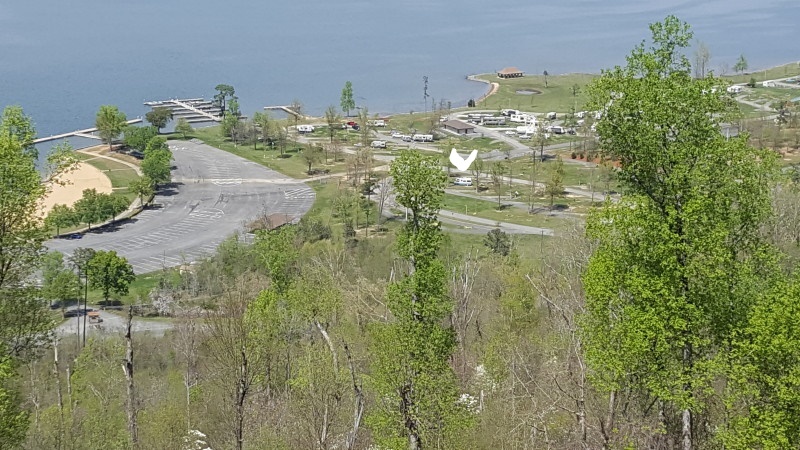 Service park was in western Alabama off Route 84. Some of the roads were very much like the above---rural, low traffic, farms, homes, and lots of managed pine forests for lumber. Isaac Creek COE was close to Service Park COE, but we wanted to look and see. 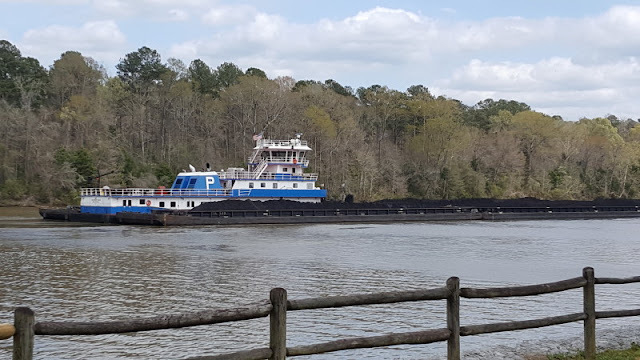 On the Alabama River and quite a ways off of Route 84. A very nice park, good separation, and great for fishermen. There was no barge traffic here because the river is too shallow. From Isaac Creek we head east to Route 21 in Monroeville. We follow that quiet, country road to Route 97 and into Florida. We wanted to catch a quick visit with niece Christine and my brother Carlton who is newly in an Assisted Living home near the north end of Pensacola. Way too short a visit, but Christine had done a great job of finding a very pleasant home with a great , friendly and helpful staff. Carl and I even had a chance to play a game of Cribbage. Jan and I stayed at a good private campground that night in Holt, Florida. River's Edge is a pleasant, comfortable park. As a Passport America discount park it is also very reasonable( half price). We would certainly consider it again as a stopover park off Route 10. From Holt, we head east again on Interstate 10 to Crestview and north on Route 85 to Florala, Alabama. The route takes us north to Elba on route 331and 84. 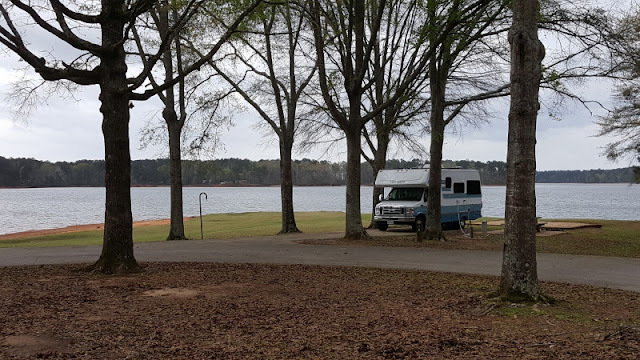 Before heading to Dothan, we break off on Route 87 to Brundidge and Route 10 to 54 to 431 to Eufala and White Oak Creek COE Campground on Lake Walter F George. This is on the border between Alabama and Georgia. There are three Corps parks in Alabama and one on the Georgia side of the huge lake. 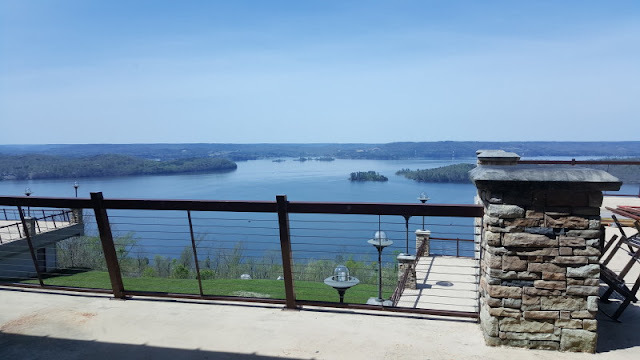 As you can see, Jan has a great view of the lake even though we are not directly on the water. The reason for that, by the way, is that it seems that Alabama and Georgia take the whole month of March to stagger their one week school vacations. 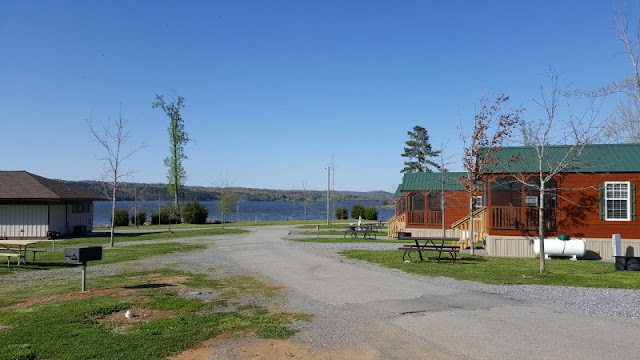 These parks are great for kids with good bike riding, fishing, some very nice, new playgrounds, and , of course, the usual camping with cookouts and S'mores. Lake Walter F George is formed on the Chattahoochee River. The following website gives more information, but note, 640 miles of shoreline. BIG lake!! 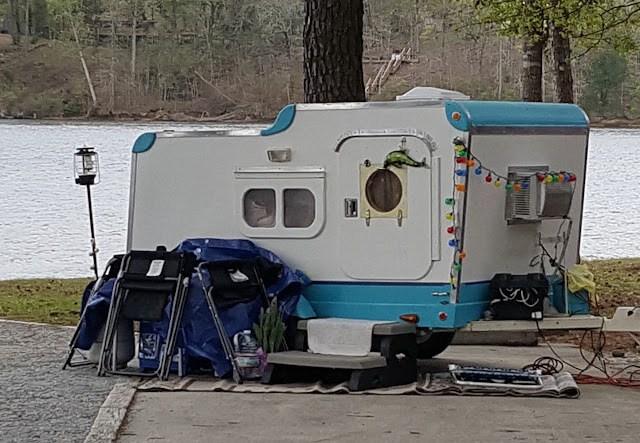 An interesting unit in the campground. Looks like an old trailer ----until you get closer and realize it is about the size of a small tab trailer. About 6 feet or so long and 4 plus feet tall. From Oak Creek we head north on Route 95 to Route 431 again. Around Seale we head off on Route 169 north to Opelika( to avoid the traffic near Columbus, Georgia). In Opelika, we jump on Interstate 85 east into La Grange , Georgia. 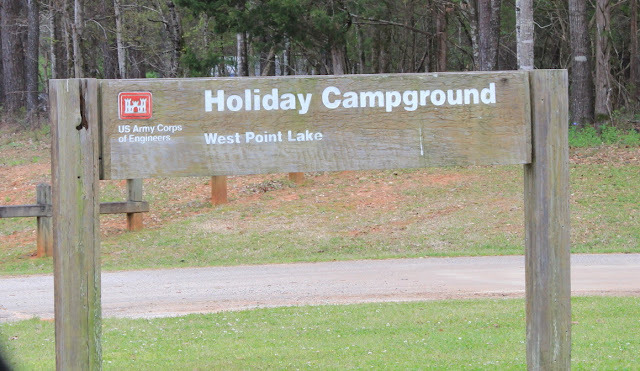 In La Grange we find route 109 out to Holiday COE Campground on West Point Lake. There are 6 Corps parks on the Georgia side of this lake and 1 park on the Alabama side. Some of these were not open yet. We had stayed at R Shaefer Heard COE campground before, but that was totally full for this weekend. Luckily we checked online for Holiday COE and found this great site above. (school vacations). A great thing about this park is that most sites of the 143 total are right on the water. 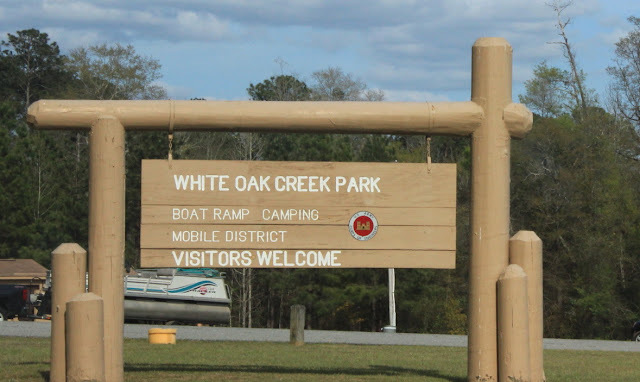 Many campers had their power boats and kayaks right at their campsite. It seemed the fishing was very good here as well. One of our favorite sites for next time. Maybe not the best for your boat, but perfect for us to view. 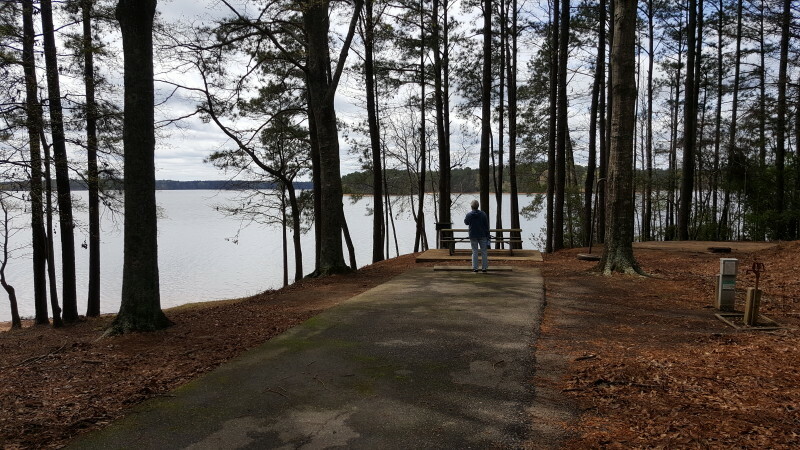 While still on the Chattahoochee River, this lake is a little smaller than Lake George---only 525 miles of shoreline. Tried some pictures with the telephoto lens at full moon. Trickiest part was getting the branch to be in focus with such slow exposures and very dark. 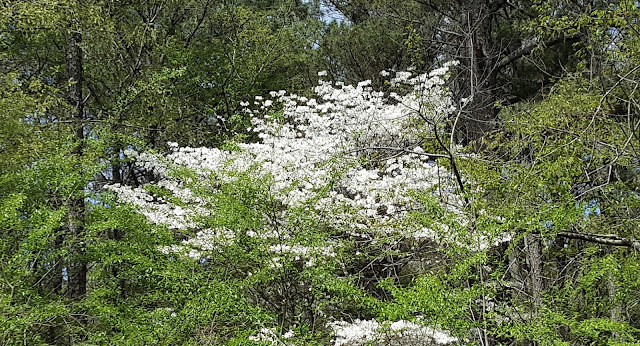 Lots of natural dogwood trees in the forest. They all stand out so well against the green of the other trees. It's like finding a surprise on your walk. 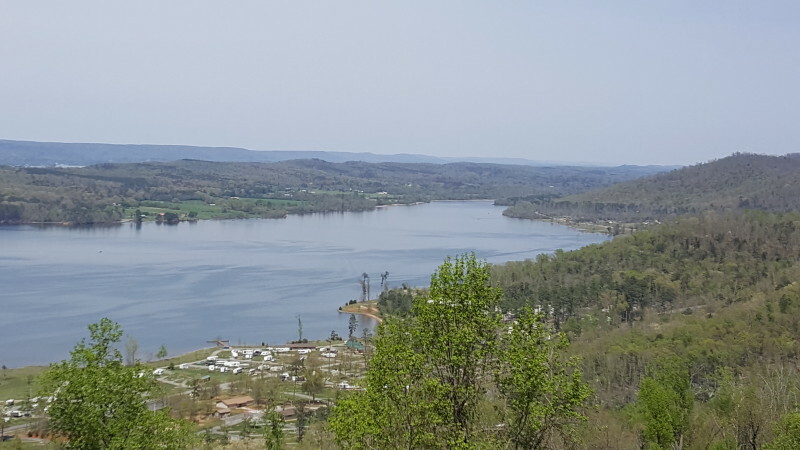 Rather than backtracking, we simply head west on Route 109 into Alabama. Then north on Route 431(again)to Route 9 and into Heflin. We then follow the routes listed in the National Forest Website. This is a great site created by Fred and Suzi Dow. They headed out in their Class C camper to try to find and list every National Forest Campground in the U.S. On the home page go down to the 3rd listing on the left National Forests and Campgrounds. Once there , we usually click to find the state and then click to find the forest . In this case , above, we looked for Talladega. We needed the guide, because the signage was very limited. This happens often with National Forest Campgrounds. 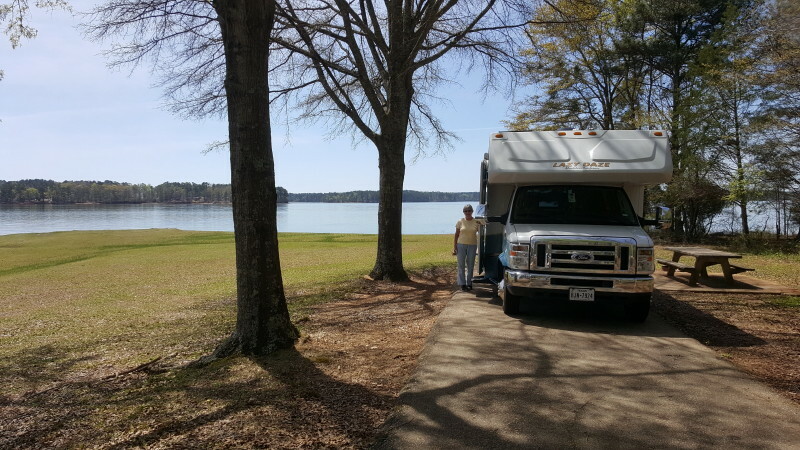 We also have to be very careful to see if the campground takes RVs. 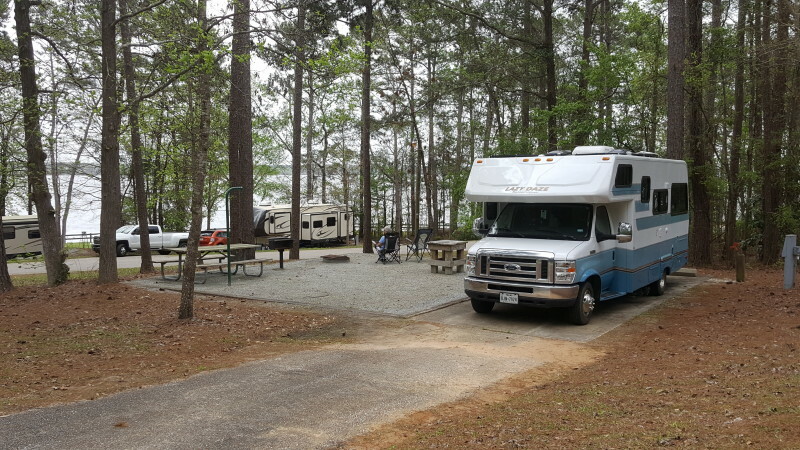 Some campgrounds are too small and the roads are too narrow or sharp curved to accommodate even a medium sized RV. This one-Coleman Lake--was superb ! The sites all have water and electric and have been recently redone. No cell phone signal, but we actually found a satellite signal through the trees. There is a trail that goes all the way around the lake. Lady Blue was quite happy. 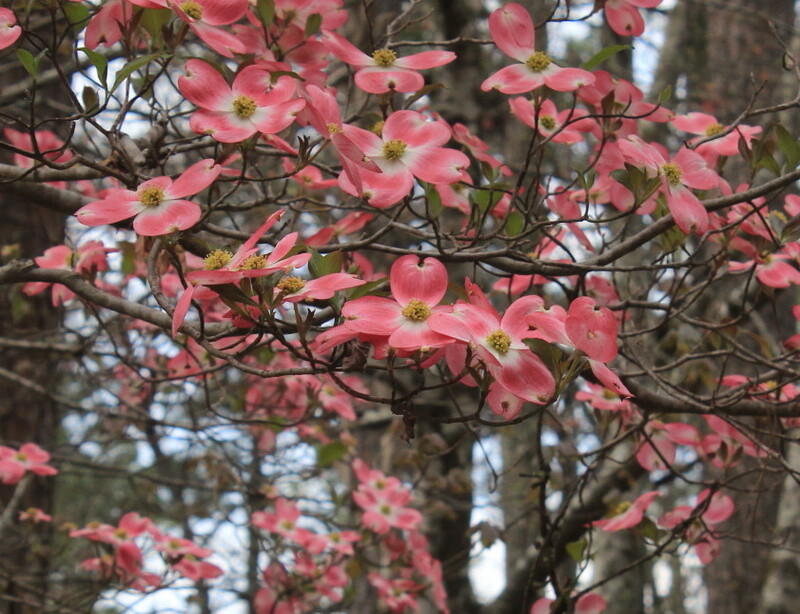 We called this a dogwood tree, as well as the usual white dogwood trees we saw. If some of you know the real name, let us know. The view up from the trail. Still on remote back roads. But every now and then a house like this one will suddenly appear. 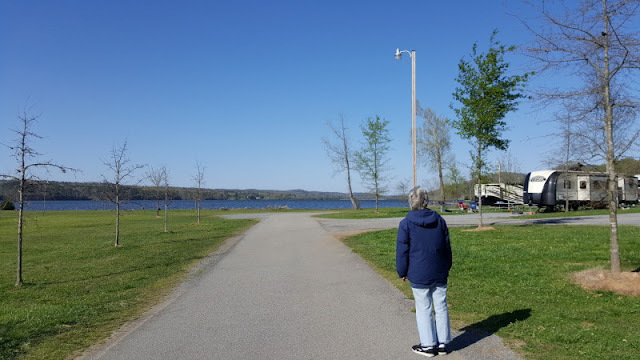 Jan and I find our way back to Route 431 and north to Albertville . From there we follow signs to Lake Guntersville State Park. The park had good rating online. And the campground is certainly well set up. 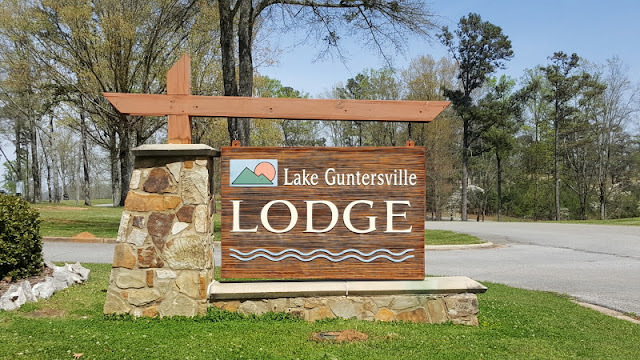 Nice spacing between campsites with many views of the lake. Again, many of the campers we saw here also had boats with them for use on the lake. A nice setup of the smaller cabins for rent. 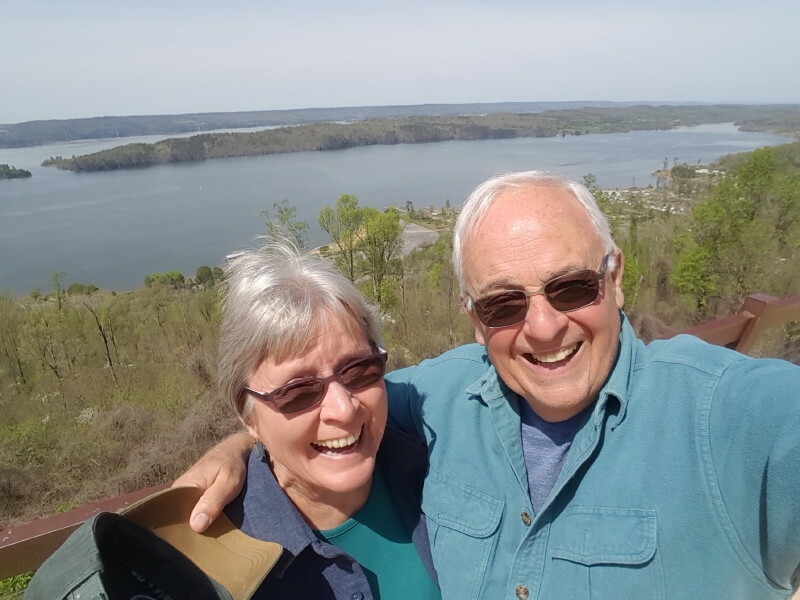 Jan and I headed up one of the trails to the Lodge. Did we say up??? Quite steep. But well worth the effort. 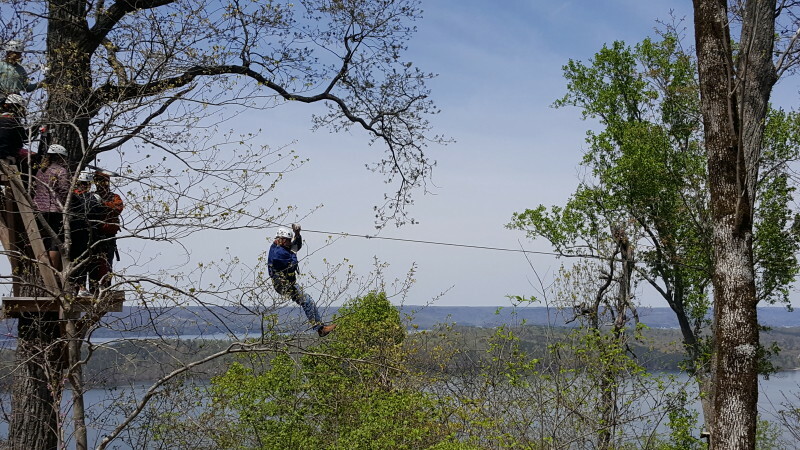 At the top of the trail is a setup for a zipline. 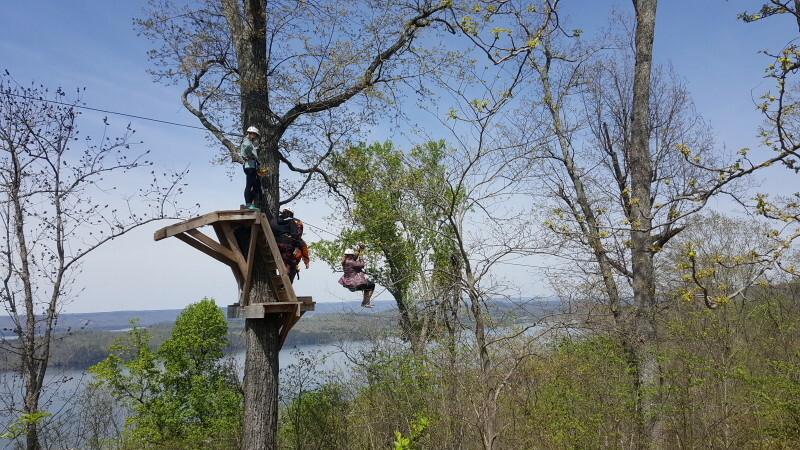 As exciting as the ride looks, we thought the scariest part has to be staying on the tiny platforms, 50 or more feet in the air, without falling off. 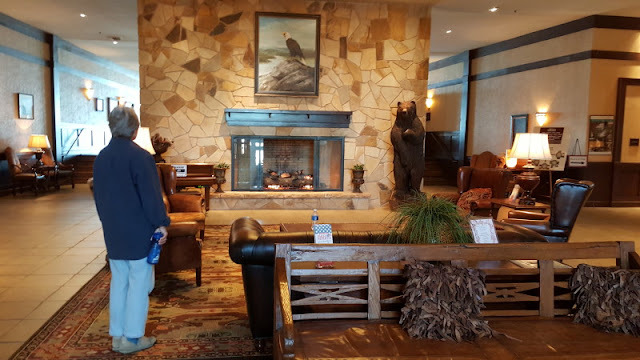 The lodge had a very welcoming lobby. Out on the deck we could see how far we had hiked up. Also just how big this section of the lake is. We thought we would add this picture just to show you the good sized boats below. Can you find them? Look for the wake in the center of the picture. Some people just hog the camera. Actually, we just keep on trying to get the picture right. Okay. So you found the boat in the last picture. Do you see Lady Blue? Yep. Right under the arrow. 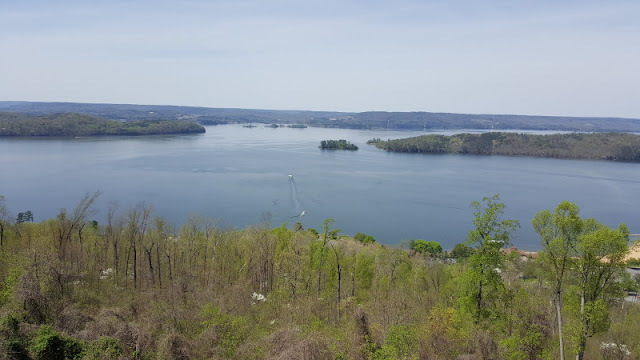 If you are here for a while, there are many trails to hike around the lake and in the hills. There is also the restaurant at the lodge as well as other restaurants in the area. Near the lobby . 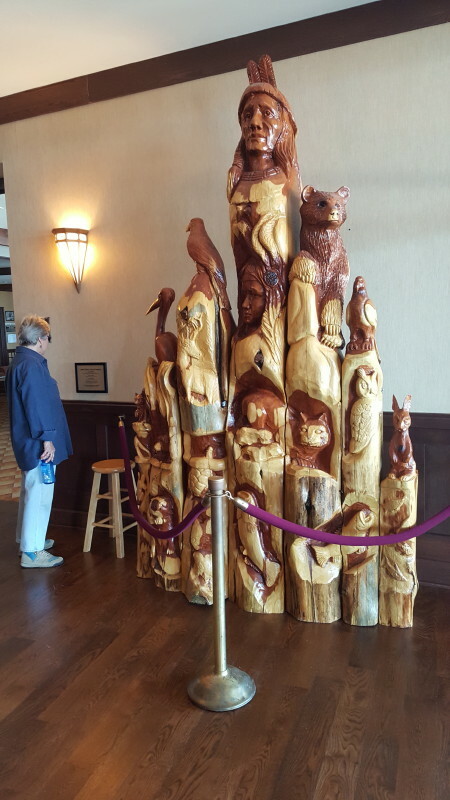 This is a number of carvings grouped together, created by local wood carvers/ chainsaw carvers.